It is published online three times a year (in January, May, and September), and covers the subjects of political science, sociology, economics, public administration, law, management, communication science, psychology, education and other social sciences. 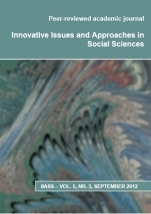 The journal is indexed in International Political Science Abstracts, CSA Worldwide Political Science Abstracts, CSA Sociological Abstracts, and PAIS International, and the editorial board consists of Ph.D’s from the Technical University of Košice, University of St. Cyril and Methodius in Trnava, University of Tampere, Institute for Electronic Participation, National School of Politics and Public Administration Bucharest, University of Marie Curie Sklodowska Lublin, University of Belgrade, University of Manitoba, Berlin School of Economics, University Rehabilitation Institute - Republic of Slovenia, Bialystok School of Public Administration, University of Ljubljana, and Vilnius University. The journal site is a little unusual: it features “3 steps to publish your article.” These include: “One: Send an article: We will publish all received articles of good quality without any charge. Please be patient!,” “Two: Edit an Article: We will not edit your article, but you might have to after the review,” and “Three: Publish an Article: We will publish your article in a trusted online journal.” There’s an online Submit Form, and the web site states that, “All papers go through blind peer review procedure. The Editor reserves the right to reject any unsuitable manuscript without requesting an external review. Normally review will be completed within two to three months.” There’s also an online Resend Form for authors to use to “resend [their] corrected article, as well as an online Template Layout Form for authors to use to prepare their articles for publication after the content review." It was easy to find and read article abstracts, but downloading and accessing the PDFs of articles was a lengthy, and mysterious, process. It took several minutes for articles to load, and the system gave me no indication that the download was actually taking place – the PDF suddenly appeared onscreen (after a pretty lengthy wait, with me thinking the download had not even started). There is an enormous amount of material available here, with much of it coming from and focusing on Central Europe, and for that reason, this title is recommended to researchers in Central European studies.